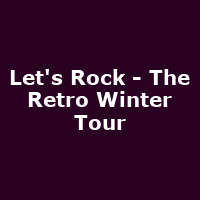 Established in 2017, Let's Rock - The Retro Winter Tour is part of the successful "Let's Rock" '80s pop series. The 2019 line-up features Tony Hadley and Marc Almond with - depending on venue - Jimmy Somerville, ABC, Nik Kershaw. Support comes from: Boney M, Altered Images, Toyah, Sonia, Dr and the Medics and more.